Artists & Creatives tend to lose time to promote themselves, work or showcases because they put their passion (Art) first.. As a social media marketer & artist, I found opportunities to create an outlet for artists to promote their passion to the right audience. I attend many Michigan art galleries to consume ways that featured artists promote themselves. Many of these artists do not have websites or social media platforms for users to find them. A website is important for artists who would like to sell fine art, home-made items or projects using an eCommerce platform to handle the transaction. An eCommerce website is a ‘shopping cart’ that lists all the artist’s items, pieces or prints so users can search online to find them. Search terms are keywords that are similar to the artist’s work – examples (abstract art, fine art, modern art, contemporary art, Detroit art). Users will type “search terms” into Google to either be inspired on their next art project or looking to buy a new art piece. 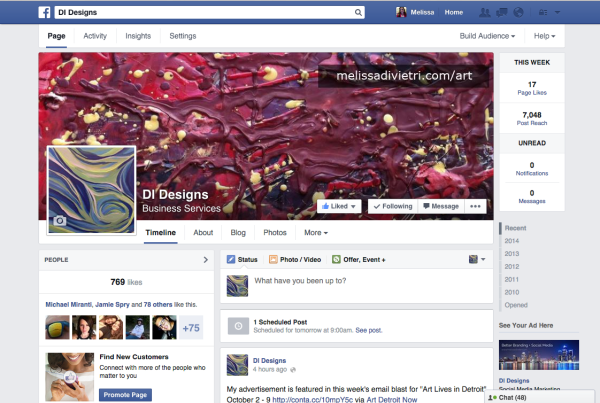 Some GOOD examples of social media platforms for artists would be Pinterest, Google+, Etsy or Facebook. Pinterest creates boards or pins for people to return to the site to look at the piece or click-thru to purchase the item. – Benefits: Content can be reposted or pinned so their network will see it. Etsy is a shopping cart style website to sell artwork directly to a consumer. Benefits: Easiest way to create a site to sell art but may take more time. Facebook will allow users to share your content & grow your audience. Benefits: Advertising helps grow a target audience to your LIKE page. Artist 1 Package – Utilize an existing social media platform to optimize your vision as an artist. Curate content for 15 posts that will publish on the social media platform of choice. Curated content can include image galleries, video, website links or text. * This is a month-to-month package. Custom graphics are additional cost of $35 per graphic. Artist 2 Package – Utilize an existing social media platform to optimize your vision as an artist. Curate content for 25 posts that will publish on the social media platform of choice. Curated content can include image galleries, video, website links or text. * This is a month-to-month package. Custom graphics are additional cost of $35 per graphic.